A special four-disc CD set celebrating Shiro SAGISU’s forty year anniversary of producing anime music. 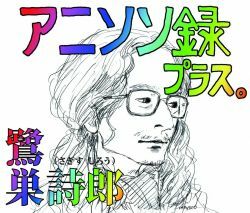 Featuring seventy tracks, including unreleased music, from the 1970s all the way to SAGISU's modern anime soundtracks. Trivia: the album is set to be released on SAGISU's birthday (August 29). M1.04 - From "Hyakuoku no Hiru to Senoku no Yoru"
Licensed by NIPPON COLUMBIA CO.,LTD. Licensed by TOKUMA JAPAN COMMUNICATIONS CO.,LTD. M3.13 - TV Anime "The Skull Man"
ⓒ2016 NBCUniversal Entertainment.All Rights Reserved. Licensed by FOR LIFE MUSIC ENTERTAINMENT, INC.